RECIFE, Brazil, Sep 27 2011 (IPS) - The steel and oil industries are still finding new frontiers for expansion. In Brazil’s impoverished semiarid Northeast the key is not, like in China, cheap labour power or abundant raw materials, but logistical advantages. Two ports capable of handling large size vessels, attractively located between the North and South Atlantic, are transforming the economy of Brazil’s poorest region. They form part of industrial complexes whose “mother plants” are large oil refineries, shipyards and a steel mill. Some 23,000 workers are building the Abreu e Lima refinery at the Suape Industrial Port Complex in the state of Pernambuco in the extreme northeast. The complex includes a petrochemical plant and a shipyard that is already building ships and oil platforms, employing 7,400 workers – a total that could climb to 12,000 in the next few years. Besides its strategic location, “for Brazil and for the world, Suape is a sheltered port with deep, calm waters that operates year-round, independently of the weather and the tides,” Roberto de Abreu e Lima, executive secretary of business development at the state’s Secretariat of Economic Development, told IPS. The refinery was named after one of the official’s forefathers, José Inácio de Abreu e Lima (1794-1869), a Brazilian who fought alongside Venezuelan independence hero Simón Bolívar. Salgueiro, a town of 57,000, now has a "floating" population of between 6,000 and 7,000 people, who pack the housing provided by construction companies, hotels or homes rented at soaring prices, said municipal planning secretary Ana Neide de Barros. Two enormous infrastructure projects – the Transnordestina railroad and the canal that will divert the waters of the São Francisco river to other parts of the semiarid Northeast – have their operational base in this town in Pernambuco state. The population of Salgueiro, which has a privileged location at the junction of highways BR-116 and BR-232, which run north-south and east-west, respectively, in the Northeast, is 80 percent urban, by contrast with more rural neighbouring municipalities. Located an average of 600 km from eight of the nine state capitals in the Northeast, its role as a supply hub will be strengthened by the Transnordestina railroad, said Barros. For that reason, the planning secretary is not worried about what will happen in terms of jobs once the infrastructure projects – "which have drawn many people from outside" – have been completed. She said that in Salgueiro, "only people who don't want to work aren't working." As an "intermodal transport hub" for the Northeast, there will continue to be many jobs in Salgueiro, trade will expand, the number of hotels, restaurants and industries – like a computer factory – will grow, all attracted by the logistics facilities, she said. In the past, local businesses have seen the occasional bouts of prosperity as a passing thing, but they are starting to believe it is here to stay this time, Barros said. Suape, a public port that is privately operated, is the motor of the rapid economic growth in Pernambuco, which has outstripped the national average for years, Abreu e Lima said. “Without the port there would be no refinery,” which will process up to 230,000 barrels a day of crude oil, he said. Ten of Brazil’s 14 refineries are in the south-central wealthy and industrialised part of the country, where most of the nation’s oil and natural gas reserves are located off the coast. But now the Northeast will have two other large refineries, besides the one in the Suape Industrial Port Complex. The largest, Premium I, is under construction in the state of Maranhão. By 2019 it will be processing 600,000 barrels a day of oil, although it will begin to operate at half that capacity in 2016, according to its owner, Brazil’s oil giant Petrobras. And in Pecém in the state of Ceará, in an industrial port complex like the one in Suape, Petrobras is preparing to build Premium II, scheduled to being operating in 2017, with a processing capacity of 300,000 barrels a day. The oil industry has thus reached the Northeast, but more focused on processing than on extraction from the area’s limited oil deposits. The Suape petrochemical plant will produce raw materials for textiles, thus bolstering the garment industry, which is already flourishing in several areas of the Northeast. At the Suape complex, eight companies will be joining the Estaleiro Atlântico Sul (South Atlantic Shipyard), a joint venture between Brazilian companies and South Korea’s Samsung Heavy Industries, announced Sílvio Leimig, director of Suape Global, a multisectoral forum that aims to transform the port into an international oil, gas, offshore and shipbuilding equipment and services supply complex. That will generate demand for the establishment of a metallurgical industry, which will be given another boost by the factory that Italian car-maker Fiat plans to build in the city of Goiana, 100 km from Suape. The plant, which will produce 250,000 cars a year, is to be ready in 2014. Growing demand for steel is paving the way for a major presence of the iron and steel industry, whose absence in the Northeast will begin to be filled by a plant being built by Vale – the world’s largest producer of iron ore – and South Korean partners in Pecém, with a capacity for three million tons of steel sheets. The current industrialisation process in the Northeast is following the same model as the southeast adopted five decades ago, with a great deal of foreign investment, oil and steel, said Tania Bacelar, a professor at the Federal University of Pernambuco who is a respected expert on the regional economy. But it also breaks with the history of failures in the Northeast, she said. The Superintendence for the Development of the Northeast, which was created in 1959, made little progress, despite the many incentives it offered. Suape, first conceived of as a port that would drive industrialisation in the area and which began to be built in 1970, is only now becoming a reality. “This is happening as a result of Brazil’s fast-growing domestic market and decisions from outside (the region),” said Bacelar. Former president Luiz Inácio Lula da Silva (2003-2011) gave new momentum to the process when he decided that new refineries should be built in the Northeast and he promoted the national shipbuilding industry and production of equipment for the oil industry in this region, she said. Domestic consumption in the Northeast has grown as poverty has shrunk in the last two decades, since the 1988 constitution ensured rural workers the same rights and social coverage as urban workers, and as a result of the newfound stability of the national currency since 1994 and the expansion of credit, also made possible by the formalisation of millions of jobs and the introduction of numerous social programmes, Bacelar said. There are poles of development in the interior of the Northeast, such as the textile trade fairs “that draw buyers from around Brazil and even from Angola,” and which compete successfully with similar, cheaper Chinese products because they are of better quality and because they follow the fashion dictates spread by Brazil’s popular soap operas, the economist said. Logistics is also a “decisive factor,” she said: the Northeast already has four world-class ports. The challenge now is to avoid the over-concentration of industry in Suape and the metropolitan region of Recife, the state capital of Pernambuco, and to spread the development to the interior of the region, said Felipe Chaves, a senior official at the state Secretariat of Economic Development. To that end, the 1,728-km Transnordestina railroad is being built, to link Suape, Pecém, and areas where soy and iron ore are produced in the state of Piauí, west of Pernambuco. The railway is to being operating in 2013. 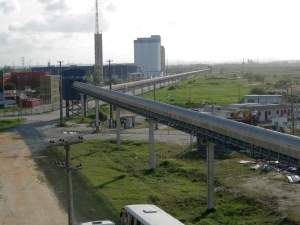 The western part of the state of Pernambuco will also benefit from the railroad, which will reduce the cost of transport of the state’s abundant gypsum, benefiting both the construction industry and agriculture. Agricultural gypsum helps reclaim soil, which could boost productivity of sugar cane, an important crop that has lost competitiveness in the Northeast with respect to production in the central-southern part of the country. Gypsum has not been used for that purpose yet in the Northeast because earnings did not compensate the cost of transporting the product distances of more than 600 km, said agronomist Fernando Freire, the head of the Joaquim Nabuco Foundation, an Education Ministry body. Besides logistics infrastructure, the interior of the Northeast is in need of “human capital,” and to that end 60 state technical schools have been established, and universities are opening up new campuses, said Chaves. “The shortage of trained and skilled workers is the biggest hurdle to development in Pernambuco,” Abreu e Lima said. The fast progress has also had undesirable impacts: deterioration of roads, and traffic jams, especially around Suape, skyrocketing housing prices, growing pollution, and increased violence, drug addiction, prostitution and teen pregnancy. Local politicians say actions are being taken to mitigate these effects.